Chef Andrew weighs in. He certainly supports any honest effort that encourages people to cook together at home. We resumed our conversation with Sherry Yard. After 20 years as Wolfgang Puck’s executive pastry chef for all his restaurants Sherry has departed for a new venture of her own. She has teamed up with Sang Yoon, the proprietor of Father’s Office and Lukhson both located at the former Helms Bakery site in Los Angeles. The ambitious new effort, The Helms Bakery, will start construction next month and has an anticipated opening in January of 2014. You might think of it as a pastry clubhouse with a broader menu of savory treats, too. It’s a casual breakfast, lunch, and dinner spot with a welcoming vibe. It’s a café to come and linger. It will be a mini food hall with an array of appealing stations to choose from. The breads will be baked on the spot and also sold there at retail. They will roast their coffee beans on-site. The original family-owned Helms Bakery opened on this site in 1931 and was the official bread of the 1932 Los Angeles Olympics. Their concept was home delivery to neighborhoods throughout Southern California in their distinctive yellow delivery trucks. All their baked goods were packed in the truck’s sliding oak drawers. The consumer looked at the various trays of incredible baked goods and picked what they wanted. Everything was delivered fresh that day and of the highest quality. The iconic Helms Bakery ceased operations in 1969. The buildings, and exteriors, were preserved for a new development which houses decorator showrooms and various creative businesses in addition to Father’s Office and Lukshon. 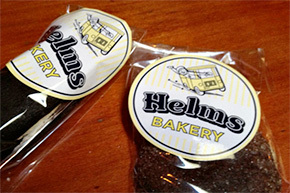 A museum chronicling the rich history of the Helms Bakery is located within the H.D. Buttercup showroom space on the property.